Born May 23, 1707 – Jan. 10, 1778. 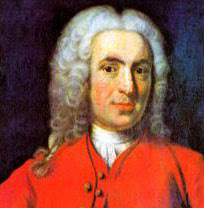 Linnaeus was born in 1707 in Sweden. He headed an expedition to Lapland in 1732, travelling 4,600 miles and crossing the Scandinavian Peninsula by foot to the Arctic Ocean. On the journey he discovered a hundred botanical species. He undertook his medical degree in 1735 in the Netherlands. In 1735, he published Systema Naturae, his classification of plants based on their sexual parts. His method of binomial nomenclature using genus and species names was further expounded when he published Fundamenta Botanica (1736) and Classes Plantarum (1738). This system used the flower and the number and arrangements of its sexual organs of stamens and pistils to group plants into twenty-four classes which in turn are divided into orders, genera and species. In his publications, Linnaeus provided a concise, usable survey of all the world's plants and animals as then known, about 7,700 species of plants and 4,400 species of animals. These works helped to establish and standardize the consistent binomial nomenclature for species which he introduced on a world scale for plants in 1753, and for animals in 1758, and which is used today. 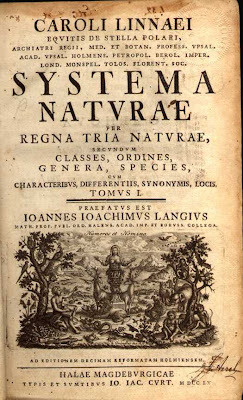 His Systema Naturae 10th edition, volume 1(1758), has accordingly been accepted by international agreement as the official starting point for zoological nomenclature. Scientific names published before then have no validity unless adopted by Linnaeus or by later authors. This confers a high scientific importance on the specimens used by Linnaeus for their preparation, many of which are in his personal collections now treasured by the Linnean Society. He was granted nobility in 1761, becoming Carl von Linné. He continued his work of classification and as a physician, and remained Rector of the University until 1772. Schultz's "War That Time Forgot"
Did Dinosaurs Die In A Fiery Holocaust? In the Field, At Last!